We looked at LOTS of ideas for Adali's birthday. She and I searched and searched all over Orlando for something that she would love. That's when we came across Exotic Animal Experience in Orlando! Not only were there a bunch of wild animals, they were all pets and you could hold, pet, feed and play with them. This was made for Adali! We made our appointment for 11:30 on Tuesday morning! We drove over an hour to get to Leslie Rush's home where she has raised all these wild animals from infancy. They have run around her house in diapers, slept in her bed & they have even gone to the grocery store with her! Can you imagine seeing a wallaby in your local Publix? Upon arrival Leslie greeted us with a smile and excitement. You could tell right away that she LOVED what she was doing and you could also tell that the animals loved her! We signed a waiver and we were ready to hold some wild animals. Leslie started off with a young Wallaby named Rooby. She was wrapped up in a towel resembling her mommas pouch and she was so adorable. A hefty 10 pounds and Adali was beaming. It's not every day you get to hold a baby wallaby! He wasn't too keen on having his picture taken but he loved being on your shoulders! On to the Lemurs! We met Charlie - a brown Lemur - and we fed him grapes through the cage. We also met Lolli the Tri-Colored Lemur, and Poppi the Black and White Ruffed Lemur. They loved to have their backs scratched just above their tail and enjoyed some cheerios from Adali! Adali's favorite (and mine) was Kiwi the Kinkajou! This little fella was so adorable. He was shivering and wanted to be held very close and tried to get in shirts and jackets of anyone who wanted to hold him. They have a 5 inch tongue to lick nectar from flowers it was the cutest little animal. We met many other such as Mia and Mojo the Muntjac Deers. They are native to South Asia and are also know as barking deer. They are so tiny (full-grown) but Leslie told us that Mojo's bark - when in mating season - can be heard 2 blocks away! They also make this cute little squeaking noise. Sounds just like a dog toy. Adorable! Next up, the Kangaroos! We met Owen and Rooster and little Love Bug. Love Bug decided to dress up for the occasion. He's 3 years old but still loves his bottle. We fed the others some cheerios and they got lots of rubs. We met Boo, the Fainting Goat and Willy, the Pygmy Goat! Adali loved meeting them. Goats are on her list for when she has her own farm! Blue and Latte, the Angora Rabbits were the softest and cutest rabbits I have ever seen! Adali didn't want to put Latte down and then she convenced me to hold him, which made me not want to put him down. Crazy soft. I loved watching her with the animals. She just has a way with them that is hard to explain. So gentle and loving to every one of them. The last animal of the day was Zoey, the Zebra. She was kept in a fence and we weren't really able to do much with her besides take a picture but Adali was fine with that! Of course we can't leave out Dozer and Keeva. Dozer is an old dog who has a hard time getting around but sure does love it if you scratch his belly. Keeva is HUGE! Though, Leslie said she is rather small for her breed. She is an Irish Wolfhound and so sweet. Since Leslie as raised all these animals together since infancy they all think they are siblings. They all get along and play together (for the most part) and most all of them have spent lots of time in her home. It's really neat to see how the animals responded to her. 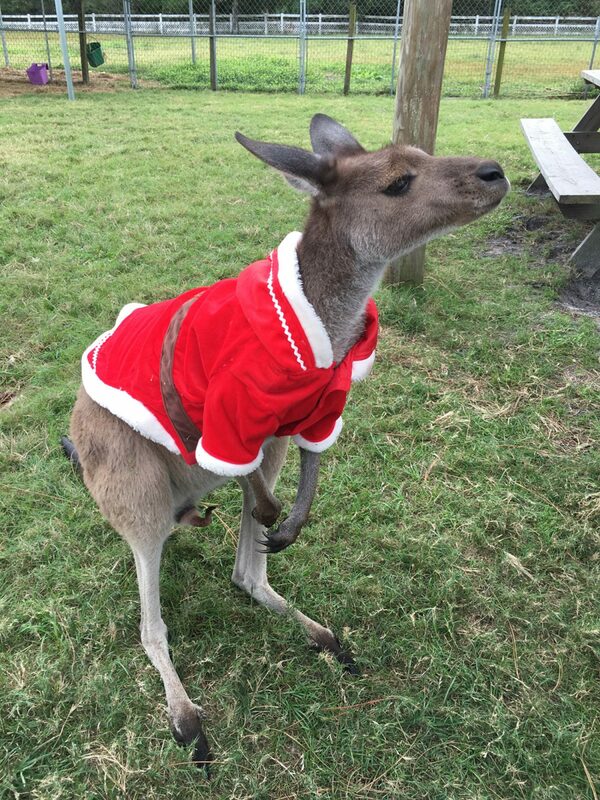 Who knew you could actually have a kangaroo as a pet? Adali loved our time at the Exotic Animal Experience farm and we would recommend it to anyone who is considering visiting when in the Orlando area. It's a bit pricy, but you are with the animals for 2 hours and Leslie will tell you all about the animals and answer any questions you may have. I mean, can you really put a price on holding a young wallaby and a kinkajou in the same day? I think not!